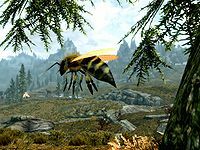 Bees are passive creatures that can be caught as they fly around, or they can be collected out of beehives, along with beehive husks and honeycombs. In terms of combinations of two ingredients, Bees can be combined with 33 other ingredients. Bees are categorized as a common ingredient, meaning that all apothecary merchants have a 36% chance of carrying 1-5 samples. In addition, they may be randomly found in some barrels and in apothecary's satchels. 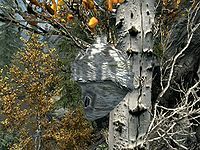 Also see our Skyrim map with beehive locations now marked. This page was last modified on 13 February 2019, at 22:16.